Masaki Matsushima, one of the most imaginative and creative Japanese designers always see’s [sic] his city as "positive", "lively" and pulsating "... With Tokyo Smile, Masaki has introduced a fragrance that reflects this spirit, and captures the youthful enthusiasm and energy of Tokyo. This lively floral, crisp fragrance is an invitation to smile and feel the zest for life ... whatever happens. The notes feature yuzu, grapefruit, passion fruit, peach, peach blossom, champaca, rose and crystal musk. 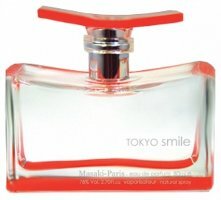 Masaki Matsushima Tokyo Smile is available now at First in Fragrance in Germany, in 40 or 80 ml Eau de Parfum. Hmm. I say yes to all of the notes except peach. If the peach is not too promiment, I might enjoy it and I LOVE Yuzu. If I had yuzu growing in my garden, I would be taking a yuzu bath on a cold winter evening like this. I would add this to my list to try. I hope we’ll see it here…their US distribution is spotty. Once upon a time (not really, it was like year ago) I really liked Masaki Matsushima creations (especially for men) but now I can’t stand any of these. I thing my nose has gotten better and fussier. I’ve not tried any of his creations. In your opinion, what was lacking or was wrong with them? Matsushima creations tend to be very subtle in my opinion, the fragrance bouquet was very quiet and quickly fading away. When I tested some of Masaki’s perfume non of them stayed on my skin longer than 3 hours and that’s a poor result, I think. Sounds as if the designer is catering to the Japanese taste – subtlety. Then again, why do that when it’s marketed globally? Perhaps it’s just poor execution/result, as you say. Are you going to sample it at least, or I made you say no? If I can get 3 hours out of a scent I’m thrilled. Lol. I tend to avoid a lot of the subtle scents for that reason. Most of them are gone in sixty seconds on me. Masaki’s are even more subtle than average, so it would probably last less than 60 seconds on you. Maybe you just haven’t found the right one that would be light and lasting on your skin? My impression of Masaki Matsushima fragrances is that they are cheaply-made but that they are often fun and assertive. He had some cherry scents and chocolate scents that were really fun. The bottles have been pretty cool too. Also I think they have a short (3 yr?) shelf life even if unopened. I’ve never heard about them till now. Lucasai, I think Matsushima is hard to find at US retailers; Sephora carried many of his until they dropped him two years ago. I will give it a try, if I can get a sample in the UK. Some of them are fun, but they’re mostly geared young & don’t always use the highest quality materials. Ok, here’s a bottle that makes sense, looks good, and is stylish and simple, yet serves the message that the fragrance is trying to convey. Agree — really like the bottle. Hah! I saw the bottle and instantly thought about yuzu and specially peach. Interesting notes; passion fruit is delicious. Would have to check, but this bottle reminds me of those Kenzo floral eaus. I’ve been tempted to try this line in the past but somehow never got around to buying any of them. But this one has a lot of my favorite notes and since it is an edp, perhaps the longevity will be better and it will have a longer shelf life. A girl can hope. Love the bottle! It’s the first time I’ve heard of this line.